Regardless of what industry you’re working in, employers look for a desirable set of general skills. We’ve rounded up some of the most valuable ones to help you land your dream job sooner, stay there, and work your way to the top. Don’t worry if you’re not a pro in all of these areas yet! With special attention and practice, you can start to build these skills both in your professional life and personal life. Find out how you can start a new career in one year or less. Why it’s important: Communication, both verbal and written, is essential in every aspect of life. When interviewing, you’ll need to communicate how your skills are a fit for the job. In the workplace, it is how you build relationships with your co-workers and team. Effective communication is clear, concise and focused and involves listening to the views of others. Why employers look for it: Workers are more productive when they communicate effectively with their peers. If everyone is well-informed of the who, what, why, when, and where, a more cohesive and efficient team will emerge. This, in turn, can boost employee morale. Why it’s important: Almost every business relies on multiple people who are working towards a common goal. As a result, it’s very important that workers synthesize their individual talents in a way that contributes to the group. Why employers look for it: Not only does teamwork build morale, it can also help solve problems. Through collaboration and brainstorming, a team can exchange ideas and come up with creative ways of doing things. Why it’s important: Being proactive means creating a set of goals for yourself and taking the steps necessary to make them happen. When you are proactive, you work to create your own opportunities. Why employers look for it: Employers are busy running their businesses and, as a result, seek self-motivated, intelligent and proactive workers who can take initiative, work autonomously, and identify future opportunities. Why it’s important: Effective problem solving skills empower a person to identify the causes contributing to a problem, brainstorm all possible solutions, and implement the best strategy. Choosing solutions based on data and facts, rather than emotions, is very important. Why employers look for it: Challenges inevitably arise in every organization. Employers really value people who can come up with solutions when plans go off track. Why it’s important: Computer skills have become increasingly important as companies have started depending more and more on technology to run their business. Why employers look for it: The ability to use specialized programs like Microsoft Word, Excel, Quickbooks, and Photoshop may get you hired for a job over someone who doesn’t have those skills. With a background in these specialized programs, it means less time training and fewer mistakes. 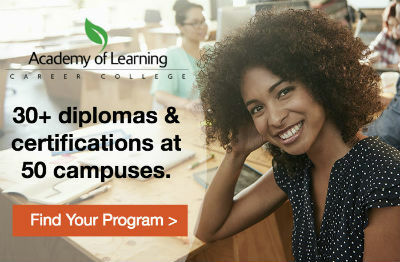 At Academy of Learning Career College, we believe in honest, creative, and flexible education. Our world-class Integrated Learning System focuses on each person’s unique learning needs, delivering a structured curriculum that is easily digestible. We empower you with the flexibility to learn at your own pace and set your own schedule. Choose from over 30 diploma and certificate programs including Accounting, Business, Healthcare, Hospitality, Information Technology, Legal, Office Administration, and Web Design.